Graduate student Jennifer Lamori, senior McKenzie Melius, and redshirt senior Emma Newton will compete in the Conference Challenge this weekend. This weekend, the Tulane track and field team will continue its outdoor season at the Cole-Lancon Conference Challenge at the University of Louisiana at Lafayette, where Tulane will compete against Southern University and Southeastern Louisiana University. The meet will begin with the women’s javelin throw at 8 a.m. Saturday, April 13. Track events, however, begin at 2 p.m. with the women’s 4×100 relay. For this event, Southeastern has entered one team and Southern has entered two. Tulane did not enter a relay team for either the men’s or women’s 4×100 events. The 1500-meter events will follow immediately after. Graduate students Tom Coe and Jennifer LaMori performed well in the 1500-meter and 800-meter events in both of their last meets, at the Texas Relays and Bobcat Invitational respectively, and hope to carry that success into Saturday. Other 1500-meter runners competing at the conference challenge include seniors Pierce Hill, Emma Newton and McKenzie Melius along with sophomore Reid Belanger. Hill, Belanger, LaMori and Coe will also run in the 800-meter event. Rebekah Markel, Tulane senior and indoor pool vault conference champion, along with the rest of the Tulane pole vaulters, will not compete in Saturday’s conference challenge. Markel recently won the American Athletic Conference’s Field Athlete of the Week for her performance at the Texas Relays last weekend. Adam Pennington from Southern Louisiana will be the only athlete to compete in a pole vault event at the meet. Tulane sophomore Kyla Denwood will be the sole Tulane athlete in the women’s discus throw. Denwood’s career-best throw of 40.06 meters puts her third of seven in the pre-meet rankings. Sophomore James Watson is a heavy favorite to win the men’s javelin event as his personal best is 12 meters above the personal best mark of any other athlete at the event. Watson scored his career high 56.64 meters at the Southeastern Louisiana Strawberry Relays on March 3. 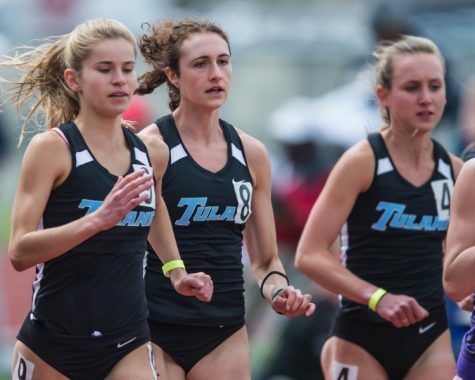 Eight Tulane distance runners will run in the 3000-meter event. Freshmen Evans Kipchumba, Jamie Polakoff and Ian Valdez as well as sophomores Carlos Zervigon and Andrew Kipkemboi make up five of the nine total athletes in the men’s 3000-meter. Redshirt senior Emma Newton, sophomore Brigid Selfors and junior Mary Catherine Stovall enter the women’s 3000-meter as the top three based on past personal best times. Following this event, Tulane will then move on to compete in the Mt. Sac Relays and the LSU Invitational on April 19-20, before competing in the AAC outdoor track and field championships in May.